Applying actions is a time-saving process for performing routine tasks on files, but it can streamline your work even further by applying actions to all open files. You have two more files in this project that need to be resized and given strokes, so you'll apply your automated action to them simultaneously. 1 Close the Dandelion.jpg and Sand.jpg files. Make sure that only the Pears.jpg and Leaves.jpg files are open. 2 Choose File > Automate > Batch. 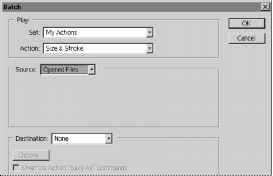 3 Under the Play section of the Batch dialog box, make sure that My Actions is selected for Set and that Size & Stroke is selected for Action. 4 In the Source pop-up menu, select Opened Files. 5 Leave Destination set as None, and click OK. 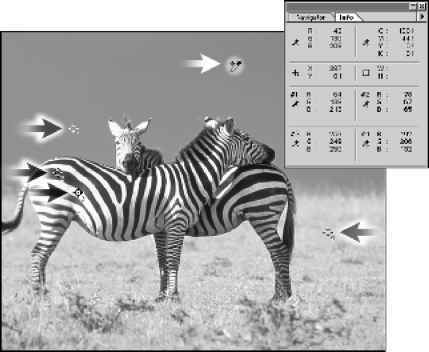 The action is applied to both the pears and leaves images, so that the files have identical dimensions and strokes surrounding them. 6 Choose File > Save and then File > Close for each of the two files. In this exercise, you batch-processed only two files instead of making all the same changes in each of them; this was a mild convenience. But creating and applying actions can save significant amounts of time and tedium when you have dozens or even hundreds of files that require any routine, repetitive work.